Create beautiful event schedules in minutes with our schedule builder. Easily share schedules with the public or with specific groups of attendees. Build your own event schedules using our schedule builder. Share a single schedule for everyone, or share certain schedules with specific groups of event participants. It’s up to you and how you want to set up your event program. ClearEvent keeps everyone on schedule. Our easy to use schedule builder lets you manage and share dozens of schedules with ease. The best part? You don’t need to be a web designer to build beautiful schedules. Schedules are always up to date. 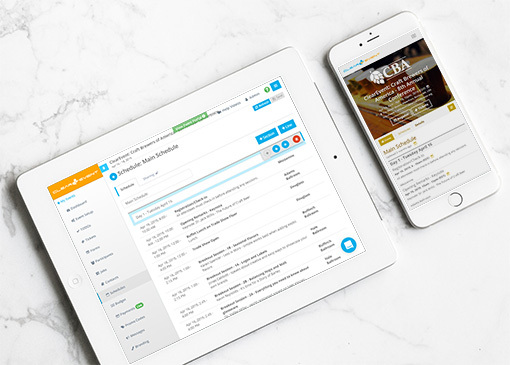 Changes made to your schedules are instantly available using ClearEvent’s included Mobile Event App. You never need to worry about participants using emails with old dates or incorrect details ever again. We’re event organizers too. We know your pain and we’ve built some amazing event management features to help take the load off your shoulders! Sign up now to create your event for free. No credit card required. No trial expiry dates.